(NaturalNews) Sauerkraut combines the health benefits offered by all cruciferous vegetables (a category which includes cauliflowers and brussel sprouts as well as cabbage) with the probiotic advantages derived from the fermentation process. Cabbage offers a host of health benefits. It is high in vitamins A and C. Studies have shown the cruciferous vegetables can help lower cholesterol levels. Cabbage also provides a rich source of phytonutrient antioxidants. In addition, it has anti-inflammatory properties, and some studies indicate it may help combat some cancers. However, this already helpful vegetable becomes a superfood when it is pickled. I have known for a long time the health benefits of eating fermented veggies, but it is very hard to find them in the store. You have to make them yourself. I already make my own milk kefir and water kefir, and drink store-bought kombucha, but I have been missing out on the wonderful superfood filled with healthy gut bacteria. So, I have been making my own recently. I purchased a fermenting crock -- mine is a 5 Liter Crock and sometimes I buy already shredded cabbage, and other times I just buy a couple heads of cabbage and chopped it or shred it myself. Sometimes I add in shredded carrots as well. This time, I coarsely chopped up two heads of cabbage, put it in a mixing bowl and with my hands, squeezed it to release the juices. I squeezed for about 5 minutes and then my hands got tired so I was done. 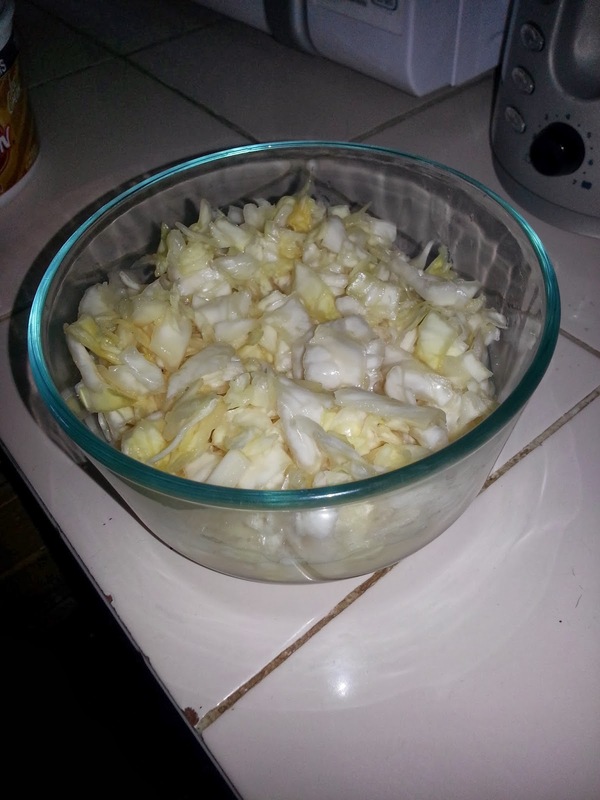 I then put the cabbage in the crock as shown in the picture. At that point I make my brine. I don't measure or anything fancy. 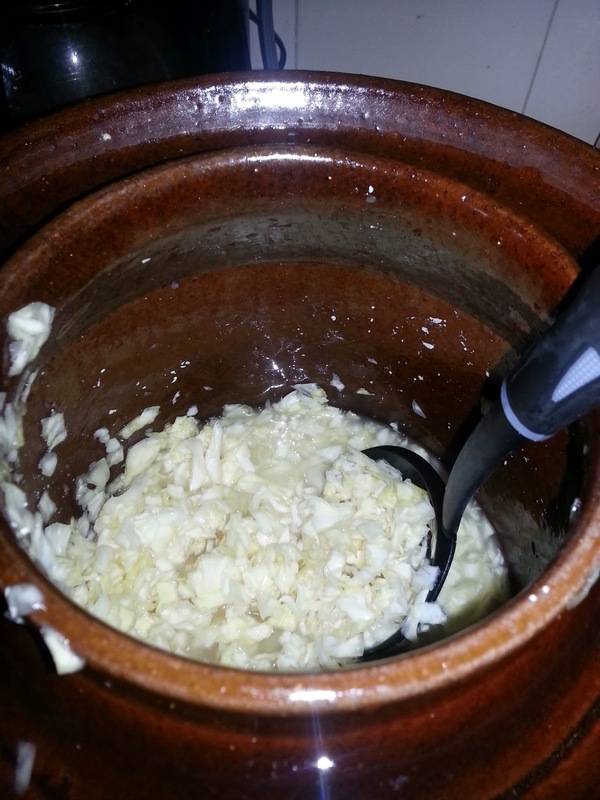 I previously saved some kefir whey (to use as a starter culture -- I don't have to use any starter culture but I prefer to). I put about 1/4 cup whey in some warm water and about 1/8 cup Himalayan Pink Salt. I taste it to make sure that it tastes salty, and so then I pour the brine into the crock. The cabbage has to be underneath the liquid, so you have to make more brine (add more water and salt) until you can cover the cabbage. (I don't measure so I can't tell you how it should taste or how much liquid to put in, but mine tasted pretty salty). Some people add salt to the cabbage before squeezing it, I have done that before but I didn't do that this time. The crock I have came with some weight stones, and I put them on top of the cabbage to keep it down under the brine. (these stones seem to mold easily so I clean them and scrub them before each use, and spray with vinegar and water and let dry completely). Then, I set the crock on the counter and put the lid on. The lid sets in a rim that you fill with water so that it makes a perfect seal, air cannot get in, but any air bubbles inside can "burp" their way out. This time I waited only one week. I filled the rim with water maybe twice during the week. Sometimes I wait 2 weeks, but I wanted my cabbage a little crunchier than normal, as I was splitting it with a friend of mine who has stomach issues, and needed more probiotics. the finished product -- YUM!